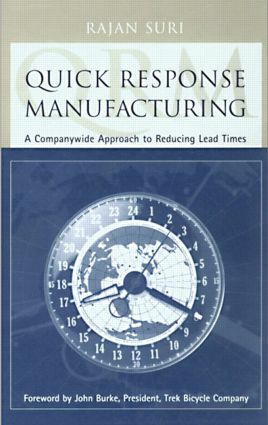 Developed by the author and now being employed by a number of businesses, Quick Response Manufacturing (QRM) is an expansion of time-based competition, aimed at a single target with the goal of reducing lead times. The key difference between QRM and other time-based programs is that QRM covers an entire organization, from the shop floor to the office, to sales and beyond. Providing guidelines for establishing a QRM enterprise, this volume builds upon kaizen, TQM, TPM, and other practice to help organizations streamline all functions of their operation. It shows how to quickly introduce products, along with ways to rethink materials and production management. "Rajan Suri's principles of Quick Response Manufacturing are easy to grasp and powerfully effective. They allowed us to reduce elapsed manufacturing time from 23 days to 7 days and work-in-process by 41 percent." "Dr. Rajan Suri explains Quick Response Manufacturing (QRM) in easy to understand terms: why it is necessary, its benefits, and how to implement it. At John Deere, we are using the QRM philosophy and tools to train our employees and our supply base. QRM has enabled us to implement changes that improve customer response time and take millions of dollars out of our supply chain."